I am honoured to publish this ‘guest feature’ on the MeshWORKS concept by the remarkable Fred Krawchuk. A former colonel with US Army Special Forces, Fred has used the Gravesian approach as a key conflict management tool in several extremely difficult and highly dangerous situations – not least in undermining the insurgency in Iraq 2006-2007. This is discussed in part in The Sons of Iraq – a Step towards Stratified Democracy? (Fred’s somewhat controversial appearance at Don Beck’s workshops at the Integral Centre in Boulder, Colorado, in March 2009 and the challenge that presented to my own thinking is discussed in the Blog post Don Beck’s got Who at His Workshop This Weekend…?!?!?!). After his military career Fred consulted with the RAND Corporation. He also began teaching leadership, negotiation, and strategy at IESE Business School. He has led high-performing teams in over 30 different countries. 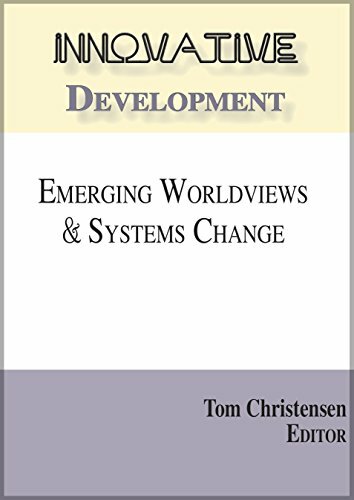 Fred’s feature originally appeared in Innovative Development: Emerging Worldviews and Systems Change (Integral Publishers, August 2015), edited by the late Tom Christensen. It is reproduced here with Fred’s permission. With the exception of some minor formatting changes, it is reproduced exactly as it appeared in ‘Innovative Development’. To maintain the integrity of the piece as published, I have retained Fred’s use of the SDi terminology. However, for the purposes of this site, readers should effectively susbstitute ‘Gravesian’ for ‘SDi’. Witnessing people suffer and even die as a result of divisive conflict inspired me to search for creative approaches to volatile and uncertain situations. My experiences as a military officer over the last 25 years, working across the domains of government and civil society around the world, taught me that collaborative approaches to complex challenges can work. Harvard’s Program on Negotiations, a trip to Northern Ireland to study the conflict there and my support of a mediation process for an Israeli-Palestinian delegation were opportunities that provided me with pragmatic tools and rich practice in multi-party negotiations. Participating in Don Beck’s workshops over the years provided me with a comprehensive framework in which I could integrate and align my learning and experiences in order to successfully apply SDi theory to volatile and complex challenges. For example, designing a series of collaborative forums for groups of over 300 diverse stakeholders from over 20 countries using SDi principles to explore alternatives to violence in Southeast Asia. I learned that no matter how difficult the challenge, you can always find people with the know-how to generate effective outcomes. In facilitating a variety of interagency and multinational initiatives in many hotspots around the globe (including Iraq and Afghanistan) using SDi MeshWORKS design, I learned the value of patiently cultivating relationships, developing collaborative processes and discovering the possibilities of common ground for collective action in order to make a positive impact. In this chapter I share a 2nd Tier guiding framework to help others successfully create and facilitate productive collaborative endeavours based on my experiences in applying SDi concepts. Research and input from a variety of scholar-practitioners also bolster this comprehensive approach to complex challenges by establishing superordinate goals and effective ways to achieve them. Finally, I share practical applications throughout the article taken from my work in Afghanistan to illustrate how to place these ideas into action. This chapter is intended for readers who want to learn how to apply SDi theory to make a positive impact on complex challenges that affect multiple stakeholders. I want to share my learning with civil society leaders who are searching for better ways to navigate turbulence in a sea of multiple actors. This chapter on MeshWORK design will serve business managers who are seeking to enhance organisational performance and take their global ventures to the next level. Government officials who want processes with which to manage complexity will find a tried and tested framework in the following pages. Social entrepreneurs will learn anew ways to broaden their networks and enhance efforts to make a positive impact. This article will also support leaders of non-governmental organisations that appreciate systemic approaches to dynamic challenges. Note: Matthew Markopoulos (2012) outlines the importance of people, place, process, and purpose in multi-stakeholder collaboration. I offer practice as a fifth component. First, I explore ideas around why people join multi-stakeholder initiatives and the potential superordinate goals of such forums. Stakeholder vMEMES play important roles in MeshWORKS. Then I examine the different kinds of people involved in an SDi enterprise. Stakeholders, the convening or management team, facilitators and storytellers are the focus in this section. Having the best possible participants, in terms of diversity, will and capacity, plays a vital role in the outcomes of an SDi MeshWORKS endeavour. The place where people come together to generate dialogue is the third critical component. Stakeholders need a safe container in which to open up, connect and design new possibilities. A thoughtfully-crafted process that galvanizes stakeholder commitment is the fourth key element. An expertly facilitated process creates the possibilities for discovering mutual interests, generating future scenarios, building new relationships and fostering pilot projects. Ways to maintain momentum and share narratives about the endeavour are also critical aspects of the SDi MeshWORKS process. The fifth and final element is practice; collaboration, like any successful collective endeavour, requires training and development. This comprehensive approach shows how to take the design principles of SDi and apply them to a complex challenge faced by multiple stakeholders. Definitions: I assume the reader has a basic understanding of commonly-used SDi terminology, so I will not define those here. However, to facilitate the sharing of the 5P approach a few other terms should be explained. First, the term ‘stakeholder’ refers to both the “participation of citizens as individuals and to the participation of organized groups” who are affected by a complex issue and care enough to do something about it (Chris Ansell & Alison Gash, 2007, p546). Second, ‘complex’, ‘messy’ and ‘wicked’ are used interchangeably throughout this chapter to refer to issues “for which there is no consensus on the problem or on the solution, and partisan interests (potentially) block collaboration” (Peter Denning & Robert Dunham, 2010, p315). Third, I define ‘governance’ as “the systems that brings shareholders and institutions affected by a specific issue together to share information, explore solutions and make collective decisions”, bearing in mind that not all institutions actively seek or engage stakeholder input (One Earth Future, 2013). Lastly, I define all collaboration as one path of transformation for stakeholders who want to make a positive impact. It facilitates the growth of individuals and groups who are willing to come together to explore new paradigms. I believe that “collaboration is practice of creating new and new observers and new actions together in a mood of commitment to take care of of the concerns of all parties as best possible.” (Denning & Dunham, p339). The purpose of multi-stakeholder collaborations is to enable people come together to think, feel and act in new ways in the form of a shared inquiry with others. Don Beck & Chris Cowan (1996) emphasise the need to ask the right questions and clarify desired outcomes early in the design process to help formulate superordinate goals. Organisers, with input from participants may have a specific purpose in mind, for example. Or, they may prefer to allow the MeshWORKS dynamics to emerge organically as the process unfolds. Second, people come together to collaborate for many different reasons. Understanding what stakeholders care about and developing an overarching purpose can help focus the design of an SDi endeavour. The following chart outlines key operating mindsets at work within individuals and groups. 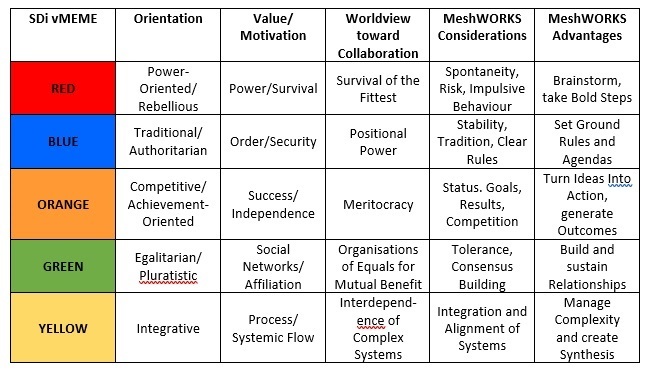 This SDi framework can help everyone involved in the MeshWORKS enterprise work more effectively with the variety of perspectives among various stakeholders…. Bringing out the strengths of these orientations cam bolster the MeshWORK process. When a group is establishing the ground rules for the endeavour, stakeholders who care deeply about order (BLUE) will be helpful contributors. The rebels in the room (RED) have much to offer when bold and audacious ideas are needed. When the group is looking at collective action plans later in the process, stakeholders who are results-oriented (ORANGE) naturally provide the needed push to get good ideas into action. Those who are inclined towards tolerance (GREEN) will work toward the inclusion of the diverse opinions present. Participants who have a knack for seeing complex systems (YELLOW) can help others connect the dots and appreciate interdependence. What is important to recognise is which mindsets are prominent among the stakeholders present. Upon this determination all can be integrated in the best way possible to support the organic unfolding of the collaborative process. Understanding the values of the participants and why they want to contribute to the endeavour is a critical aspect in the design of a successful collaborative enterprise. Practical application: Rugged terrain, a myriad of diverse tribes, nationwide poverty, a weak central government, widespread corruption, multiple distinct languages, 30 years of war and a general distrust of foreigners combine to create an incredibly complex and uncertain environment in Afghanistan. At first glance, any possibility of collaborative action seems impossible. However, this case actually provided my colleagues and me a surprising opportunity to successfully apply an SDi approach in concert with multiple stakeholders. Assisting Afghans with rebuilding rural communities after decades of conflict required an intimate understanding of social networks, the socio-economic environment, and how to build partnerships to co-create sustainable systems to meet essential needs. The wide variety of stakeholder groups offered an equally wide variety of motivations for their respective activities in Afghanistan. Some saw collaboration as a way to help their respective elements achieve optimal results. Others saw it as a way to improve their positional power. Certain organisations, feeling overwhelmed by day-to-day activities. saw the initiative as an unnecessary drain on their already-limited resources. A handful felt they could do things on their own and did not see the value in working as part of a larger enterprise. A number of groups wanted to find a better way to coordinate activities among themselves to avoid duplication of effort and inadvertently stepping on each other’s toes. All of the groups, in spite of these differences, valued stability and urgently wanted to alleviate violence in Afghanistan. An appreciation for the diversity helped us to assess the plethora of perspectives and concerns. Various international organizations aspired to build Afghan governance capacity. Regional stability. trade and commerce, and business development motivated selected stakeholder groups (ORANGE). International security forces wanted safety and security (BLUE). Several non-governmental organizations and Afghan civil leaders were striving for social justice, education, development and human rights (GREEN). Certain groups wanted to increase their political power (RED) while others competed for financial growth (ORANGE). Many Afghan community leaders worked hard to meet the basic needs of their villages (BEIGE, PURPLE). In rural areas, Afghans wanted to farm, procure clean water and raise their children in relative safety (PURPLE). Some stakeholders just wanted to survive (RED). We sought opportunities to coalesce around these diverse interests to create superordinate goals concerning rudimentary levels of stability, development and governance (YELLOW). The diversity of worldviews held amongst the various stakeholders helped us to examine the challenge of violence in Afghanistan in a systematic fashion. This led to a shared understanding of the problem and closer alignment on collective actions. By coordinating our efforts, we avoided duplication of effort, filled gaps and addressed the roots of violence in a more comprehensive fashion. Stakeholders learned to blend security, development and governance programmes more effectively which helped reduce violence and increase stability. The diversity of worldviews shapes not only the purpose of a MeshWORKS endeavour but also the people who make up the enterprise. Beck & Cowan stress the importance of carefully selecting the ‘Streams Team’ that will help manage a collaborative SDi process. In my experience, the ‘Stream Team’ should include the convening group of sponsors who provide a vision, convening authority, and/or the resources that make it attractive for a diverse group to come together to engage in a dialogue. Stakeholders form an inclusive group representing diverse memes who are affected by the complex challenge. Facilitators support the MeshWORKS process with politeness, openness and autocracy as needed so that stakeholders can listen to, respect and learn from each other as well they can, in a collective enquiry to address mutual concerns. Storytellers capture the narrative of the SDi process and assessors from the management team evaluate outcomes. The size, structure and roles of these Stream Team elements vary to a great extent. They depend on the nature of the collaborative effort, the complexity of the MeshWORKS issue, the needs of stakeholder groups and the available resources. According to Adam Kahane, (2012), the success of a MeshWORKS project “will depend on the people…[as they] will have the greatest influence on the content and consequences of the process and will also be most influenced by it”. Inviting people with suitable skills, values, experiences and the perspectives that best fit the SDi challenge will produce relevant benefits. This applies to the Streams Team that is managing the MeshWORKS initiative, the participants in the stakeholder group, the facilitators who guide the collaborative process and the storytellers who capture the narrative. SDi designers want a diverse and inclusive range of participants who mirror the complex system in which they live. Practical application: The diversity of the stakeholders and the complexity of Afghan social networks led us to pay close attention to the people aspect of this complex challenge. We established an engagement team to build rapport with Afghan ministries and international embassies. This team also set up meetings between our leaders and their Afghan counterparts in order to share information , relieve points of friction and develop new initiatives. Our units in the field took a similar approach. As a result, our organization and its component units engaged multiple stakeholders at the national, regional and local levels. These relationship-building efforts also helped build healthy connections between top-down resources and bottom-up needs. Another best practice that facilitated collaboration was the use of liaison personnel. With an appreciation for key stakeholder organizations, we placed the military version of Spiral Wizards in strategic locations throoughout the country. They worked side by side with Afghan ministry representatives, diplomats, local government officials, development workers and various military and police units. Video teleconferencing and face-to-face meetings with liaison personnel facilitated our decision-making process and raised the mutual awareness of needs and available resources. Together we formed a flat network of Spiral Wizards that quickly shared information and addressed stakeholder issues in an effective manner. In addition to having the right people, the place where a MeshWORKS endeavour occurs is also a critical component. People need to feel comfortable to open up, share perspectives, take risks and connect withe each other. As a result, SDi designers have an opportunity to integrate politeness, openness and autocracy into the habitus of the enterprise. According to Beck & Cowan, consideration for politeness, openness and autocracy in the MeshWORK’s design “creates a far more pleasant place to be for all concerned.” The venue then must help generate a sense of belonging and promote a relaxed environment. If this is not the case, collaboration becomes even more challenging. Creating a safe container: Social and interpersonal security are crucial aspects of designing a container for the MeshWORKS enterprise. If people feel at ease, they will be better able to lower their guards in order to become more open and available to participate. Conveners can kick of a forum by declaring the meeting venue a safe place for learning, collaboration and support. Organizers can also articulate what safeguards have been put in place to address social and physical security. Facilitators will find it helpful to acknowledge all of the diverse voices in the room and publicly articulate that everyone belongs there. Kathryn Schulz (2010, p311) recommends a statement such as: “We can foster the ability to listen to each other and the freedom to speak our minds” – which also fosters politeness and openness. Logistical planning considerations: The physical space and logistical support for MeshWORKS activities also play important roles in creating a safe, welcoming environment that is conducive to collaboration. This is where autocracy, in the form of providing structure and purpose to the overall physical setting, supports collaboration. David Strauss (p139) stresses that “the physical environment…has a powerful impact on a meeting.” Good acoustics, suitable technology for sharing presentations, comfortable seating and aesthetically pleasing views all help support optimal conditions for collaboration. Arranging the space is another way to help make the MeshWORKS forum conducive to cooperation. According to Strauss (p139), “one of the most powerful interventions you can make [in a MeshWORKS endeavour] is to arrange the seating before a meeting begins.” For example, U-shaped seating and semi-circles help focus attention on developing a shared understanding of problems and possible solutions. Successful facilitators use space accordingly with an appreciation for the needs of the group and how to support constructive conversations. Planning the space to facilitate networking and conversation during breaks also encourages collaboration. Insightful conversations take place and new connections are made “outside of the immediate work of the group” (Julia Wondolleck & Stephen Lewis Yaffee, 2000, p23), as well as within formal proceedings. Stakeholders can get acquainted over a meal or a cup of coffee. Longtime practitioners of collaboration realize that “you don’t build trust until you actually get to know people a little bit” (Strauss, p139). Away from the formal meeting, participants may feel more relaxed and find it easier to speak with each other. Setting aside the time and space for these informal conversations is instrumental to the process. Cultural considerations also influence the planning of the space. What works best in one region may be very different from what serves stakeholders in another part of the world. A key takeaway here is the need to understand the cultural context, the needs of the group and the resources at hand. MeshWORKS issues and challenges are tough enough without adding the unfavourable or uncomfortable meeting conditions. Planners find it to be in the best interests of all concerned to find and enhance the best possible meeting space for collaboration. Practical application: We conducted MeshWORKS events in different locations throughout Afghanistan and occasionally in the US, depending on the needs of particular stakeholders. Security played an important role; we did everything we possibly could to provide physically safe containers for meetings. Respect for Afghan cultural norms around community gatherings also influenced the way we arranged MeshWORK events in the field. We often utilized NATO and Afghan transportation resources to help bring stakeholders together from geographically dispersed areas. To prepare military leaders for their deployments, we hosted collaborative events in the US. During these forums. we had video teleconferences between stakeholders in the field and their US counterparts. This provided real-time sharing of relevant experiences and best practices. To broaden this exchange, we brought in a variety of practitioners from other governmental agencies and non-governmental organizations with experience in Afghanistan. Where we hosted MeshWORKS events played a critical role in our planning and coordination. The places where we prepared incoming leaders as well as where we conducted collaborative activities in the field had a direct impact of the successful outcome of these endeavours.